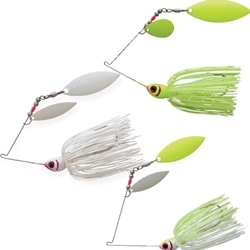 The Booyah Glow Blade Spinnerbait can be used in many situations including clear water for smallies or in cloudy conditions or stained water for largemouths! These spinnerbaits come equipped with premium blades and heads, 55-strand Bio-Flex silicone skirts, and 4/0 Mustad Ultra Point hooks. We offer them in 3/8oz and 1/2oz with either a Colorado/Willow or Double Willow blade combination.